This writing sample was created by a 4 year old girl. When asked what she wrote, the author said "Mom, I love you." This writer separated her message from the picture. This lets us know the writer understands that print conveys meaning. 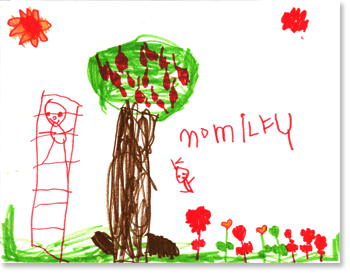 The author wrote Mom correctly, an important and frequently used word for this writer. Other words in the message have letters mapped to the sounds (LF for love) and I for I. When a child points to individual words on a page when reading, and works to match their speech to a printed word, a concept of word is developing. This awareness of the purpose and existence of spaces separating words and that spoken words match to printed words is known as a concept of word. Often called the watershed event of kindergarten, adults watch young writers insert these important spaces in their own work. 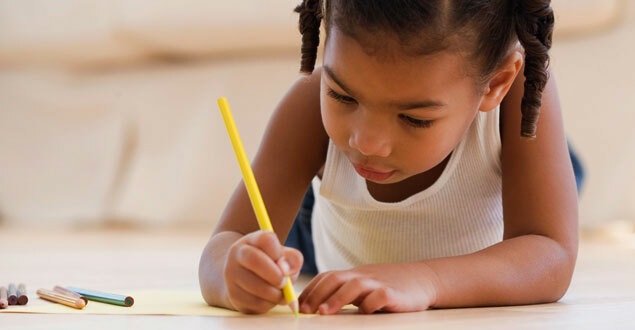 Guided either by an index finger in-between each word or by lines drawn by the teacher or parent, children demonstrate one-to-one correspondence with words. Adults can nurture the development of a concept of word by pointing to individual words while reading and by drawing lines for individual words within writing samples. Adults can also help children hear sounds in the words they are trying to write by saying words slowly and helping them match a letter to a sound.